We bought a lot of groceries today! My husband will be hosting a continental breakfast for his faculty and staff Friday--gourmet coffee, homemade muffins, fruit, and spiced tea, all ready to grab and go for the last morning of exams. This seemed like a great way to thank everyone for his first semester there and to reciprocate for the dozens of baked goods and small gifts he has been given for the holidays. The total number has swelled since our initial estimate--possibly 120 people will partake. My goal is to keep the total cost to $60, or 50 cents per person. Multiply supplies for 120 people, and every dime I save counts more than ever! 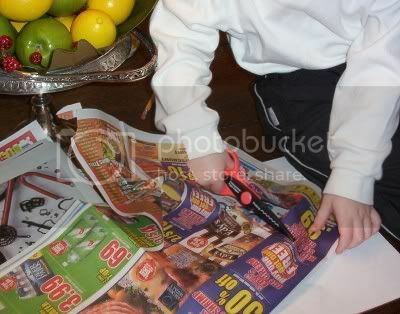 My little one got into the act by cutting out all the fruit prices from the sale circulars. Then we stapled each loss leader blurb to our master grocery list. This way, when we made our first stop at Aldi, we could accurately compare prices. Aldi was just as cheap, if not cheaper, for every fruit except grapes (99 cents at Harris Teeter) and clementines (4.99/5 lb crate at Publix). The Aldi bags held more individual fruits per pound, which suits my purposes well. For the same reason, we are paying slightly more per pound for clementines than for navel oranges--one crate holds many more clementines than an equivalent weight bag of oranges. After today, I promise--enough with the fruit! Tomorrow we get to bake 300 or so muffins and compare the cost of homemade to the giant bucket 'o batter I bought at the food wholesaler. I 100% love your blog!! I am encouraged and inspired every single day when I visit here to use my head and not my pocketbook! Hope the baking goes well for you. Post a picture of your mountain of muffins if you get a chance! Oh, my! 300 muffins? I'd be in trouble as my muffin tin only makes 9 at at time=) I guess I'd have to borrow a few. Your kitchen should certainly be toasty warm tomorrow.